Science of Happiness | Be Nice. I long while back, I stumbled upon the Richard Wiseman Blog, which contained a post about the Science of Happiness. I recommend you take a look at Wiseman’s sites–they are pretty great! It seems that a lot of things he researches are ways to live life and have everything be a little nicer. Check out the comments below the post announcing the experiment results also. They are very telling about people’s overall outlook on life’s experiences. 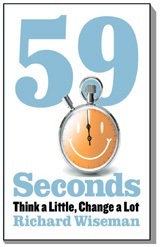 His book, 59 Seconds, is based on his research. Hope you enjoy reading! This entry was posted in More ideas from Be Nice., Nice Reading Material and tagged 59 Seconds, happiness, Nice Reading Material, Richard Wiseman, Science of Happiness by Jen. Bookmark the permalink.